pepper to taste (there is lots of salt in the beef concentrate so taste first, then salt. Add oil to your soup pot and heat up the pan first. Cut beef into small cubes and then sauté in the hot oil until the redness disappears. Next, sauté garlic, onions, celery & leeks with the beef until the onions are transparent. Add zucchini and continue to sauté for a few minutes. Add tomato paste, chilli powder and beef stock concentrate. Stir well to mix and continue to sauté for 4 minutes. Add beef stock and allow to come up to the boil. Once boiled reduce heat and simmer on medium for 15 minutes. Miriam's Time Saving Tip♥ I like my beef chunks small and beef is hard to cut into small chunks when fresh. So I freeze the meat first and then 1/2 thaw as it is so much easier to cut up beef if it is semi-thawed. 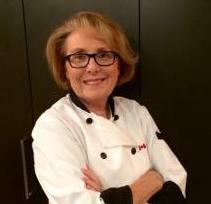 Chef Miriam Borys Busby, B.Ed., MA. My Passion for Cooking :- Mypasion is a social networking platform to finding discovers your true passion in life and test online in USA.